For those renting their property, it can be important to place a semblance of their own style within the home. But due to restrictions imposed by the landlord, renters may be prevented from achieving their ideal décor. Within this article, we’ll focus on 5 tips for renovating a rental property while keeping to all rental agreements! Most landlords will allow a renter to repaint their walls in a colour more suited to their personal tastes. But it’s important to receive the landlord’s approval before the painting process begins. While you can’t take the paintwork with you, once you move this element of the home can be critical to ensuring comfort. Remember to speak with local paint specialists at your hardware store about the product and its potential use within apartment-style environments before you begin painting the area. Rental apartments are not always in the best shape upon your arrival. Area rugs can provide you with the ideal way to quickly cover upon any dents within wood floors and unsightly stains in living room areas. A refined bookcase can be the perfect addition to an apartment space. One of the benefits to harnessing bookcases in smaller apartments is they can be used to hold pictures and to store other personal items so they’re not in the way. A simple wooden bookcase can often be used to bring signature classical style to an apartment space. For open concept apartment spaces, room dividers can be used to add a little privacy and some style to the space. They can be placed between living room and bedroom areas to help provide that sense of spatial separation. They can also be the ideal choice for social events within the rental space, where guests are only permitted in certain areas. Renovating an apartment requires you to think beyond the functional. Lighting systems can be used to enhance the brightness of the area and to bring a focus on new décor elements within your redecorated apartment space. Effective use of lighting can ensure comfort and bring balance to the entire area. The décor in your apartment space can be improved quickly and cost-effectively. 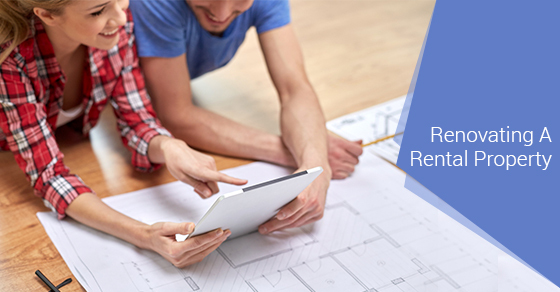 To discover more tips on renovating rental properties, contact our expert team directly!